Background : Embolization might complicate device closure of large atrial septal defects (ASDs) with deficient margins. When margins are deficient, a precariously placed device can appear to be held in good position by the rigid delivery cable. Once the cable is unscrewed, the device adopts the natural lie of the interatrial septum. This can occasionally expose the inadequately captured margins and lead to device embolization. Most embolizations occur immediately after release. Retrieval of the embolized device required prolonged fluoroscopy and sometimes open heart surgery. Objective : To evolve a new strategy of retrieval of a malpositioned device after unscrewing the cable before impending embolization. Materials and Methods : After deploying the device in place, a snare is passed through the delivery sheath around the cable to grip the screw on the right atrial disc of the device. With the snare holding the screw end, the device is released by unscrewing the cable. The device position is reconfirmed on echocardiography. The snare is subsequently removed if the device was stable. In case of device migration, the same snare is used to retrieve the device before it embolizes completely. Results : Snare assistance was used in 24 patients considered as high-risk for device embolization. Its usefulness was demonstrated in two patients with deficient posterior margin and small inferior margin where the device got malpositioned immediately after release. As the snare was still holding on to the screw end, the device could be retrieved into the sheath easily. Conclusion : This novel snare assisted device release strategy safeguards against device embolization in large ASDs with deficient rims and allows simplified retrieval. Device closure of ostium secundum atrial septal defects (ASDs) has emerged as an alternative to surgical closure and can be accomplished safely in the vast majority of cases in the current era. , A few complications, though infrequent, have been reported following device closures. Device embolization is known to occur in about 0.5% of patients. , Factors influencing embolization include large defects, deficient margins, undersized devices, operator inexperience, and inadequate recognition of device malposition on echocardiography. Percutaneous retrieval of an embolized or malpositioned device is possible in 50-75% of the cases, but can be challenging and time-consuming in many instances. , It involves prolonged exposure to radiation in the catheterization laboratory. Most embolizations occur in patients with large defects and deficient margins within minutes after unscrewing the delivery cable. A precariously placed device, which is not held well by the deficient margins, may appear to be in a good position as it is still attached to the rigid delivery cable. The rigid cable partially supports the device, which is held well on some margins, but poorly held in other margins. Once the cable is unscrewed, the device slips to the natural lie of the interatrial septum, which exposes the margins that are not captured by the device. Such a device embolizes immediately. If there is a mechanism to hold the device even after unscrewing the rigid delivery cable, we can recognize unstable device positions and devices at the verge of embolization. We propose the use of a snare to hold prophylactically on to the device before release from the delivery cable to facilitate an easy retrieval in case of device malposition before embolization [Figure 1]. This simple technique guards against further migration of a malpositioned or embolized device and simplifies its quick retrieval. The ASD is analyzed on transthoracic or multiplane transesophageal echocardiography (TEE) for all the margins and the smallest margin recorded in any one of the still frames is considered for the definition of the margins. A margin is defined as deficient if it is <5 mm. Patients with large ASDs with isolated deficiency of either the inferior or the posterior margins were given the option of surgical closure, and if they are insistent on nonsurgical device closure of the defect, then they are included in this snare assisted method of device deployment. Patients with ASDs who had combined deficiency of both the posterior and inferior rims were not considered for device closure. A patient with deficient mitral margin it is also an exclusion for this technique. However, deficient retroaortic (anterosuperior) margin is not considered an exclusion and they are routinely included for interventional closure. An informed written consent was obtained from all the patients after detailed patient counseling. The patients were explained about the alternative surgical options, and chances of failure of the transcatheter device closure in view of deficient margins. The institutional review board has permitted retrospective analysis of the data of the patients who were part of this study. The procedure was done under conscious sedation. Bilateral femoral venous access was obtained and full heparinization given. Routine balloon sizing of the defect was not done. The size of the Amplatzer septal occluder device (StJude Medical, MN, USA) was chosen from the measurement of the diameter of the defect obtained from echocardiography. A device at least 4 mm larger than the largest recorded echocardiographic diameter was chosen for the procedure. In very small children, a device at least 2-3 mm larger than the echocardiographic diameter was chosen. The delivery sheath (Mullins sheath, Cook Medical, Bloomington, IN, USA) was chosen two French sizes larger than the recommended size. This was intentionally done to facilitate easy retrieval of the device. The larger delivery sheath size also helped in the advancing the snare alongside the delivery cable within the sheath. The device deployment was done on TEE guidance. In small patients, if the transthoracic echocardiographic views are very clear, TEE was not done. If the left atrial disc margins prolapsed through the anterior retroaortic margin, balloon assisted technique was utilized. In such instances, the delivery sheath was parked in the right upper pulmonary vein from the right femoral venous access. A 0.035" Amplatz superstiff guidewire was placed in the left upper pulmonary vein from the left femoral venous access. A 33 mm equalizer spherical latex balloon (Boston scientific) was inflated over this wire across the ASD to prevent prolapse of the left atrial disc from the anterior retroaortic margin. After device deployment and confirming a stable device position on transesophageal (or transthoracic in younger patients) echocardiography with the lack of residual flows, a novel strategy of snare-held unscrewing of the delivery cable was adopted. A 7 mm or 10 mm Amplatz GooseNeck Snare (eV3 Endovascular, Inc., Part of Covidien; Plymouth, MN, USA) was passed through a 4 French Judkins right coronary artery catheter and was looped around the delivery cable. This coronary catheter was then advanced parallel to the delivery cable through the check flow valve within the delivery long Mullins sheath. Once the snare reached the right atrial screw end of the cable, the loop was tightened around the screw on the right atrial disc [Figure 2] and [Movies 1-3]. The device stability and lack of residual flows on echocardiography were reconfirmed. A small Minnesota wiggle was performed with the delivery cable to identify the stability of the device. Then the delivery cable was unscrewed with the snare still holding on to the screw end of the device. After the release of the delivery cable from the screw end, the device repositioned itself along the natural lie of the interatrial septal plane. The device stability and lack of residual flows were reconfirmed on echocardiography. The snare was subsequently withdrawn. On release of the cable, a precariously placed device tends to slip from some of the deficient margins, once the rigid support from the delivery cable is removed [Figure 3] and [Movie 4]. In such instances, there is a residual flow noted on TEE on the slipped edges [Figure 4] and [Figure 5]; [Movie 5] and [Movie 6]. These findings indicate a strong risk of immediate embolization. Such a device will not embolize since the snare is holding it and can be retrieved safely within the delivery sheath. The chosen 4 French Judkins right coronary catheter (100 cm) and snare loop (120 cm) are longer than the length of the Mullins sheath (65-80 mm) and so the end of the snare catheter can be gripped well before unscrewing the delivery cable. A selection of Mullins sheath 2 French larger than the recommended size also permits retrieval of the device by assisting the screw end to come coaxial to the end of the long sheath. The braided long sheath of the delivery system of the ASD devices is not used as they are longer and may not permit the use of the standard length Judkins right coronary catheter and snares. Twenty-four patients with mean age 25.4 ± 15.3 years, (range 3-53 years) diagnosed to have large secundum ASDs with deficiency of either posterior or inferior margins were included for transcatheter snare assisted closure between June 2012 and February 2015 after detailed patient counseling. The mean weight of the cohort was 44.6 ± 20.1 kg. The devices used were Amplatzer septal occluders (StJude Medical, Plymouth, MN, USA) or HeartR septal occluders (Lifetech Scientific Inc., Shenzhen, PRC). For three patients who needed devices larger than 40 mm, HeartR septal occluders (one 42 mm device and two 44 mm devices) were used. The device size was chosen depending on the echocardiographic largest diameter of the defect. The device diameter was larger than the defect by 2-8 mm. Balloon assistance was used in 18 patients. Two patients had two defects separated by a margin over 8 mm, which warranted use of two septal occluder devices. These two devices were placed from two groin delivery sheaths from both groins. In these patients, the posterior or the inferior defect was the one with deficient margin and was snared before unscrewing the delivery cable. The patient details are tabulated in [Table 1]. 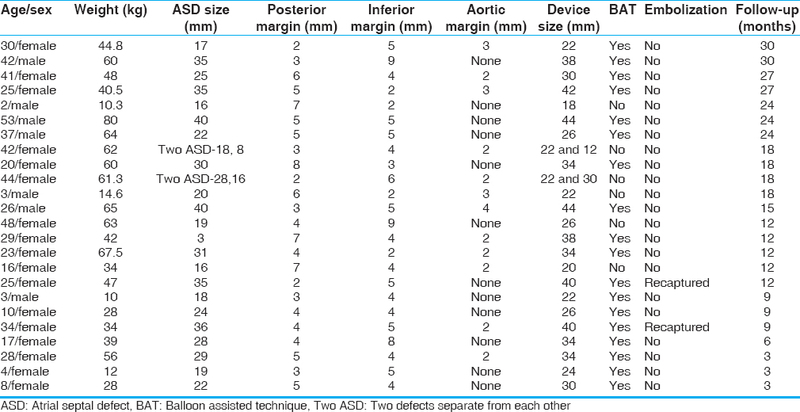 Among a total of 345 ASD device closures done in the period from June 2012 to February 2015, only 24 patients belonged to this subset where either the posterior or the inferior rims were absent or inadequate. The snare assistance was not routinely used for all large defects. In all routine device closures, it was not considered necessary to increase the use of hardware like snares, larger delivery sheaths etc., Six patients in this cohort were children younger than 10 years and the defect was measuring 15-24 mm in these children. In this cohort of 24 patients there were no other major or minor complications like hematoma, arrhythmias, air embolism or significant hemodynamic events. All patients were followed up at 3 monthly intervals; no patients were lost for follow-up. Routine antiplatelet medications included aspirin and/or clopidogrel for a period ranging from 6 to 12 months. The mean follow-up duration was 15 months and ranged from 3 to 30 months. There were no late complications in the cohort of patients. The last echocardiogram showed stable device position in all the patients. The usefulness of this technique was demonstrated in two patients. A 25-year-old lady was diagnosed to have a large 35 mm ASD on TEE with deficient posterior and small but adequate 5 mm inferior margin. A 40 mm Amplatzer septal occluder device was deployed through a 14 French long Mullins sheath (Cook Medical, Bloomington, IN, USA) with a 7 mm Amplatz gooseneck snare holding onto the screw. However immediately after the release of the delivery cable from the screw, TEE showed that the device was oriented obliquely across the septum [Figure 4] and [Movie 5]. 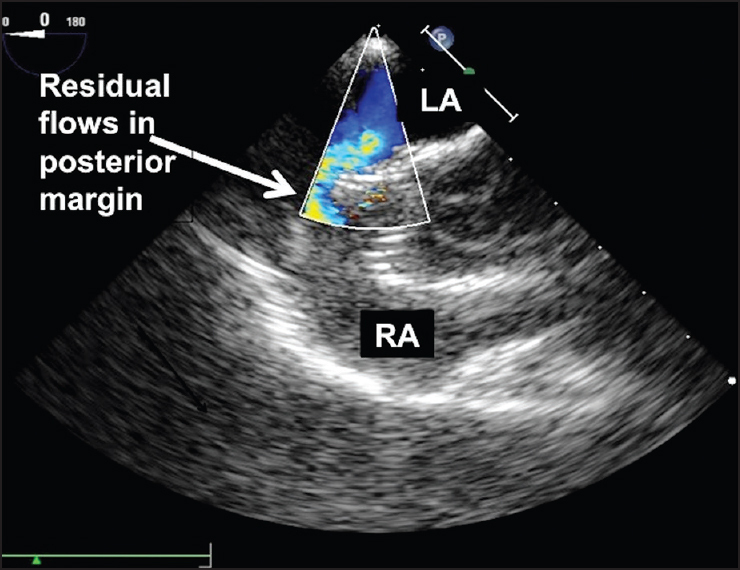 There was significant residual color Doppler flow on TEE indicating unstable device position [Figure 5] and [Movie 6]. As the snare was still holding onto the screw of the device, the device was pulled gently back into the long sheath by slenderizing it. This facilitated quick and easy retrieval of the device. The patient subsequently underwent surgical closure of ASD. Another 34-year-old patient with a 36 mm defect with deficient posterior and small 5 mm inferior margin underwent device closure with a 40 mm Amplatzer septal occluder on balloon assistance. The device appeared stable with no residual flow on TEE when the cable was holding the device. There was no flow after Minnesota wiggle too. 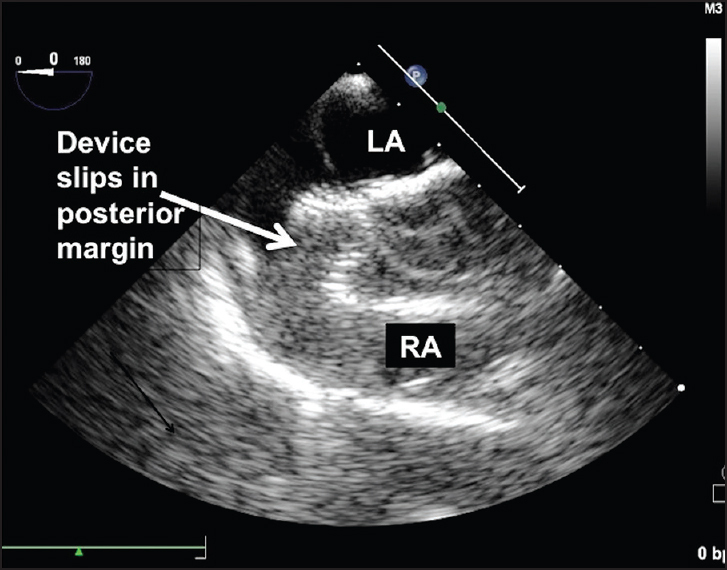 After a snare-held device release, the device slipped from the posterior margin leading to the migration of the device into the right atrium. The snare-held device was safely retrieved through the large sheath which was in place. Even though, two patients in this cohort of 24 patients had malposition of the device, all other patients had a stable device position [Figure 6] and [Movie 7]. Malposition or embolization of the device is one of the frequently reported complications in literature. Common causes of device malposition or embolization are selection of large defects with deficient margins, failure to identify all the margins accurately before and during the procedure, failure of the operator to recognize the unstable device position on echocardiography. Other causes include undersizing of the device, excessive tension on the cable, overzealous Minnesota wiggle, and improper or inadvertent deployment. Embolization can occur irrespective of the operator experience. 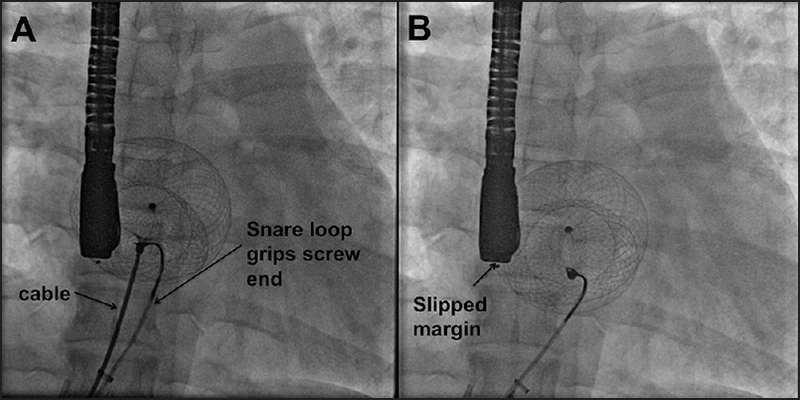 During deployment of a device across a large ASD with deficient rims, the rigid delivery cable may hold the precariously deployed device in place across the atrial septum without any significant identifiable residual flow. Unscrewing the cable will expose the device to the natural lie of the atrial septum and may result in dislodgment. In some of the newer device designs like Occlutech ASD occluders or Ceraflex atrial septal occluders which are released by a bioptome like mechanism, there is no such support like the delivery cable with screw. In these device designs, an inadequate margin may be easy to recognize. When embolization of a large device occurs in patients, percutaneous retrieval becomes cumbersome. The possible cause of device malposition in our two patients was posterior margin deficiency along with a small inferior rim. We electively chose an oversized device. The use of a snare holding onto the screw of the right atrial disc during the release of the delivery cable aided in preventing embolization of the malpositioned device and facilitated relatively easy and prompt device retrieval. The percutaneous retrieval of large devices otherwise would have been cumbersome if not for the control over the device provided by the snare. Transcatheter retrieval of large embolized Amplatzer devices was previously thought to be difficult, and surgical retrieval methods were often used. Percutaneous retrieval of an embolized or malpositioned device can be challenging in many instances though it is possible in 50-75% of the cases and several techniques have been described, including the use of large sheaths, snares, or bioptomes. In rare instances, the location of the embolized device may not favor a percutaneous retrieval. ,,, There are several reports of transcatheter retrieval of embolized devices. The screw has to be aligned coaxially with the sheath to facilitate a smooth withdrawal into the sheath. However, this needs long fluoroscopic time and prolongs radiation exposure to the patients and healthcare personnel in the catheterization laboratory. ,, Prior holding of the screw end permits very quick retrieval of a malpositioned or embolized device, as the delivery sheath was intentionally chosen larger than the recommended size. In these high-risk patients at risk of embolization, choosing a larger sheath facilitates an easy retrieval. , We chose a sheath 2 French larger for device deployment, even though a smaller sheath was recommended by the manufacturer of the device. In the past 2 years, we have adopted this novel technique of holding the screw with a snare, before releasing the device and removing the delivery cable. Once the cable is unscrewed, the rigid support of the device offered by the delivery cable is removed and the margins held by the device are reassessed on echocardiography. The soft snare catheter offers no support to the device but continues to grip the screw. If device malposition occurs or residual flow across any margin is identified, the device is retrieved with the snare. Holding the screw with the snare also facilitates better alignment of the device with the long sheath in the event of retrieval. In patients with isolated deficiency of either posterior or inferior margin alone, it may be possible to get a stable device position if the device anchors well on all the other available margins. In such cases, good procedural success can be achieved. If the device slips from any of the margins after its release, it carries a risk of embolization. This strategy was used by us in 24 patients with deficiency of either one of the margins, and we needed to snare the device is only two of the patients. These two patients where the snare assistance helped in prompt retrieval were sent for surgery electively after a couple of days as a nonemergent procedure. With this backup mechanism, such high-risk patients can be taken up for interventional closure after detailed patient counseling and education about the defect margins and chances of procedural failure. In this study, two patients had unstable device position, recognized immediately after unscrewing the cables and both the devices were safely retrieved immediately. However, if the snare catheter loosens the grip, or if more force is needed for collapsing the device into the sheath, there is a chance of embolization of the device. This technique may not prevent late embolizations and erosions. Device closure of large ASD with deficient rims can be challenging even in experienced hands and can be complicated by device malposition and embolization. If there is a careful case selection, the procedure may be successful in a large majority of patients. All operators should be adequately familiar with the techniques and equipment required for percutaneous device retrieval. The prophylactic use of a gooseneck snare during the procedure has not been reported so far. We propose the use of this simple technique especially when deploying larger devices in ASD with deficient rims. Du ZD, Hijazi ZM, Kleinman CS, Silverman NH, Larntz K, Amplatzer Investigators. Comparison between transcatheter and surgical closure of secundum atrial septal defect in children and adults: Results of a multicenter nonrandomized trial. J Am Coll Cardiol 2002;39:1836-44. Omeish A, Hijazi ZM. Transcatheter closure of atrial septal defects in children & adults using the Amplatzer septal occluder. J Interv Cardiol 2001;14:37-44. Fischer G, Stieh J, Uebing A, Hoffmann U, Morf G, Kramer HH. Experience with transcatheter closure of secundum atrial septal defects using the Amplatzer septal occluder: A single centre study in 236 consecutive patients. Heart 2003;89:199-204. Dalvi BV, Pinto RJ, Gupta A. New technique for device closure of large atrial septal defects. Catheter Cardiovasc Interv 2005;64:102-7. Errahmouni A, Hattaoui ME, Drighil A, Boumzebra D. Silent embolization of an Amplatzer septal occluder into the left ventricular outflow tract requiring emergent surgical retrieval. Ann Pediatr Cardiol 2012;5:89-91. Ahn J, Kim JH, Choi JH, Oh JH. 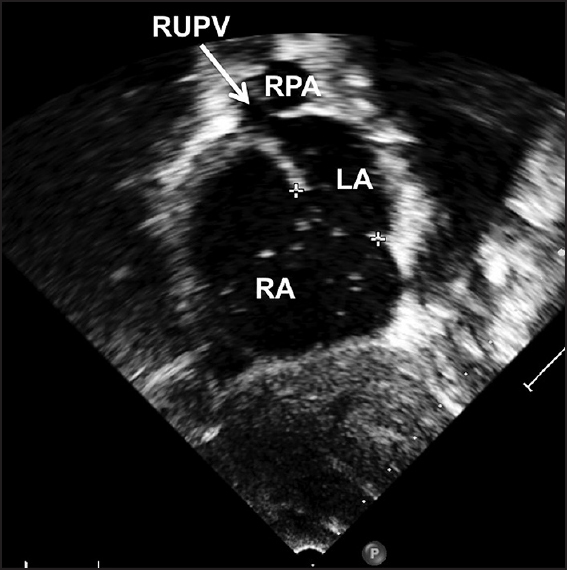 Percutaneous retrieval and redeployment of an atrial septal occluder under three-dimensional transesophageal echocardiographic guidance: A case report. J Korean Med Sci 2014;29:871-3. Pala S, Açar G, Tigen K, Kýrma C. Percutaneous retrieval of an interatrial septal occluder device embolized into the aortic arch. Arch Turk Soc Cardiol 2010;38:502-4. Yildirir A, Varan B, Ergodan I, Boyvat F. Percutaneous retrieval of an embolised occluder device from the aorta using a gooseneck snare Arch Turk Soc Cardiol 2012;40:393. Balbi M, Pongiglione G, Bezante GP. Percutaneous rescue of left ventricular embolized Amplatzer septal occluder device. Catheter Cardiovasc Interv 2008;72:559-62. 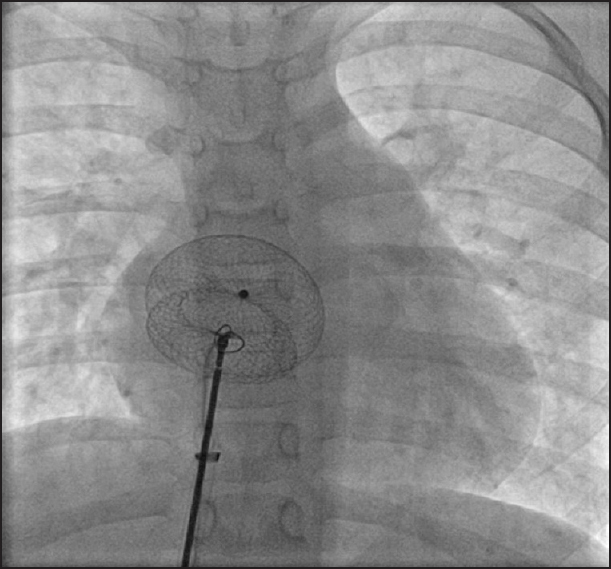 Peuster M, Boekenkamp R, Kaulitz R, Fink C, Hausdorf G. Transcatheter retrieval and repositioning of an Amplatzer device embolized into the left atrium. Catheter Cardiovasc Interv 2000;51:297-300.